My last days of summer mission in the UK involved a week and a half of Welsh language in the National Eisteddfod. The Eisteddfod is a Welsh language, poetry, music, art and culture event. It is the largest event of its kind in the world, and brings over 100,000 Welsh speakers together each year. This year its location was Cardiff Bay. I stayed with friends from the Cardiff area, Andrew Thomas and Dawn Wood, and then later Sera Owen and Robert Zyborski. 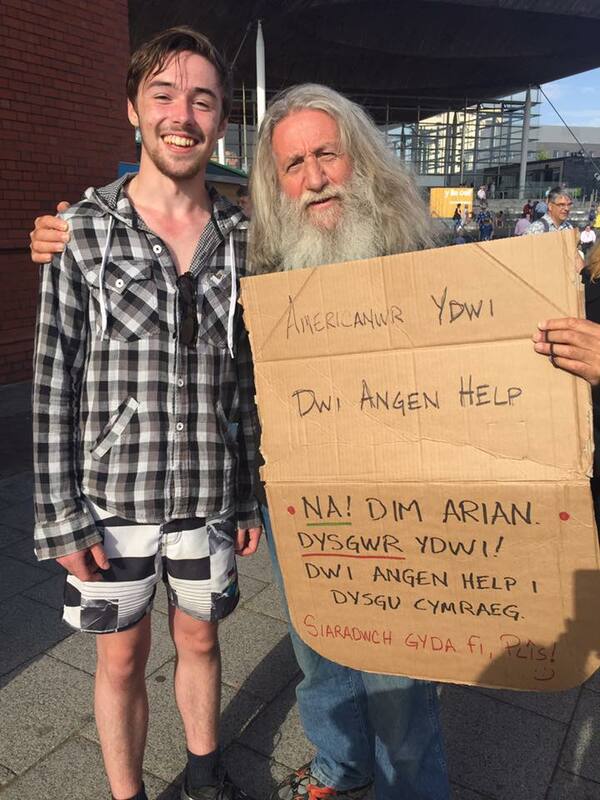 Throughout the days of the Eisteddfod I attempted two things: 1) I pretended to be a homeless American needing help, and as people walked by, I revealed that I needed help learning Welsh. My cardboard sign saying, “Americanwr ydwi. Dw i angen help” (I am an American. I need help.) flipped down to reveal the words, “Na! dim arian. Dwsgwr ydwi. Dw i angen help i dysgu Cymraeg.” (No! no money. I am a learner. I need help learning Welsh.) People would laugh, and then stop to speak with me. Often, it was the children and teenagers who wanted to talk with me. They would give me pointers on learning Welsh, and introduce me to new words, like “ysgytlaeth” (milkshake). People in Wales have struggled for centuries to maintain their language, and have done so against amazing odds. When someone from another country makes the effort to learn their language, they are deeply appreciative. This is one way into the hearts of the people in our world. As Americans, who live in a dominant culture with a dominant language, we expect people to learn our language. Yet, as John Robinson, the director of Linguae Christi describes it, we need to learn to speak to people in the “language of their hearts.” For the native first language Welsh speaker, Cymraeg (Welsh) is the language of their hearts. Their excitement at discovering an American Welsh learner was evidence of how important this was to them. But my little effort to start conversations with people also had another purpose. I was hoping to discuss the topic of poverty and homelessness with those who stopped to talk with me. Cardiff has a homeless problem like every large city in the world. It is a fast growing city, and has seen a rise in the numbers of people begging in the streets. One of the problems with being homeless is the invisibility factor. We all turn our eyes away when we see a person begging and are not going to give them help. In turn, the moment we turn our eyes away from them, they turn their eyes away form us. We typically divert our attention away from them as soon as we realize they are there. They become invisible to us, and we are intentional about making them invisible. We are ashamed that we are not giving, or that we cannot afford to give to everyone we see. This invisibility is debilitating, and is more devastating than the poverty itself. It is a deadly force that steals the souls of men and women already captured in the grip of tragedy, handicap, addiction, or any host of things that may have been the original source bringing poverty upon them. In our attempt to maintain our personal comfort by looking away, we inadvertently add another impossible load to the already heavy weight of poverty. The cruel invisibility of poverty is dehumanizing. This was a topic I discussed with people through the week of the Eisteddfod with hopes of changing perhaps a single person’s actions. Maybe as they walk through the streets of Cardiff on their daily routines they will see the homeless through different eyes. Perhaps one person will smile, or stop and talk, even when they have nothing to give. Perhaps someone will humanize them by showing friendliness to the invisible people on the streets. On my last evening in Cardiff I spent some time with Cardiff Pagan Moot. This was one more interaction, among many on this trip, with the UK Neo-Pagan community. These events in Cardiff filled my last days in the UK, and now I have returned to the US. For the last two days, I have been in Sacramento with the Multi-Faith Matters team. 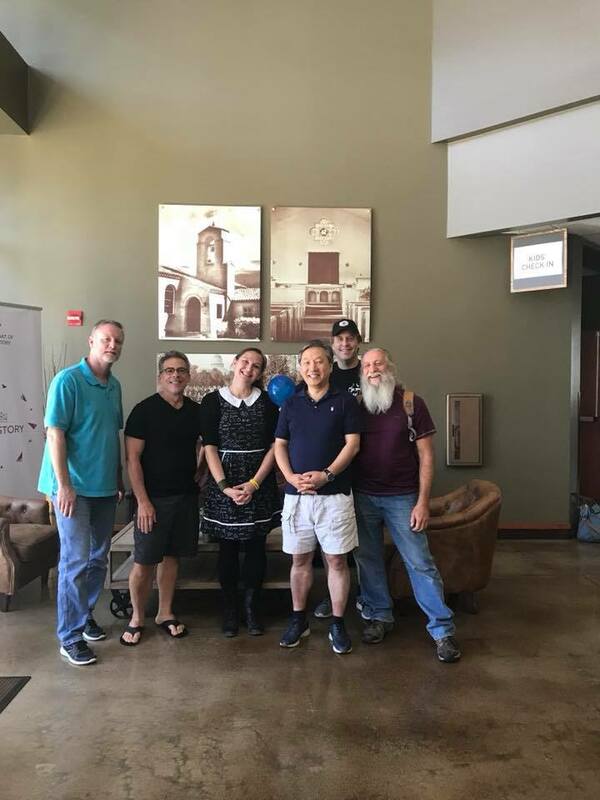 We have spent 4 years together in discussions and studies dealing with the subject of discovering how to encourage our Evangelical family to learn new ways to lovingly interact with people from all the different religions of the world. We realize this is a difficult leap of faith into a wild and seemingly dangerous ministry for many people, but it is the kind of love God compels us to show to the world around us. Our team is now in a place, where we are ready to share our findings and the successes of the individuals and the churches who are reaching out to people of other faiths. If you are interested in having the team from Multi-Faith Matters come to your church and offer training and experience in redemptive Multi-Faith engagement, let me know, and I will connect you with the appropriate individuals, whether you need help in dealing with the fears people have about Islam, Neo-Paganism, New Atheism, or any of the many related subjects. You can help support this mission through a couple different means. Prayer is the biggest, and there is a Facebook page I can add you to, if you would like to join me in prayer. You can also support this mission financially by giving. Follow the link and go to the bottom of the page. You can also support my work as a writer, musician, and God traveler on Patreon.